Well in typical fashion here is a belated post! December is always a month to remember! 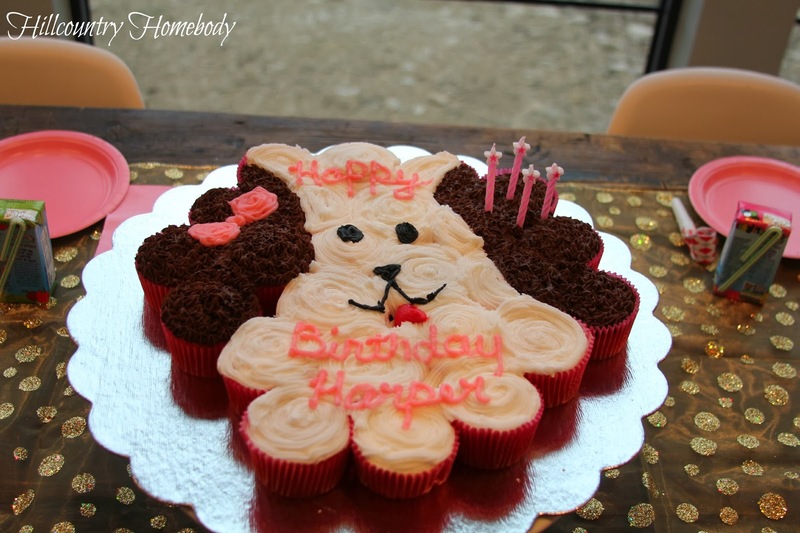 Especially when you need to remember to throw in a birthday party for a very special little girl in your life. I'll be honest. 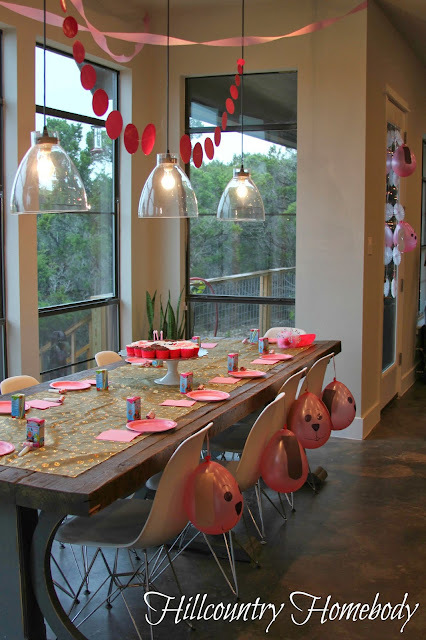 I have the hardest time sitting down and getting a party together for our youngest because it falls smack dab in the middle of December. 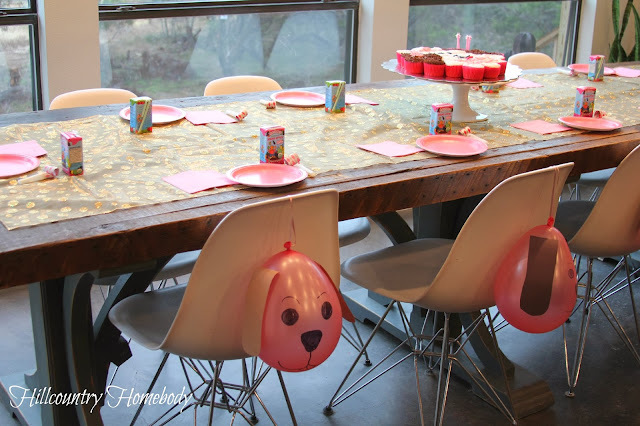 It's a tough time for everyone to squish in another party so I have been hesitant and we typically just go out to eat and then celebrate with cupcakes and our little family at home. This year was different. I knew I needed to get my stuff together and do something for my little four year old. 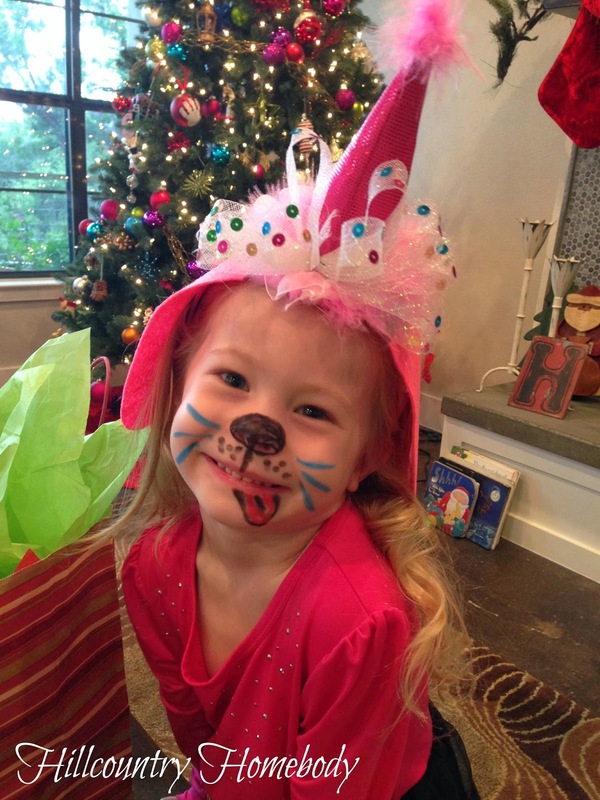 She had her own ideas of what she wanted her party to be like and she was excited! She wanted a "puppy party"! 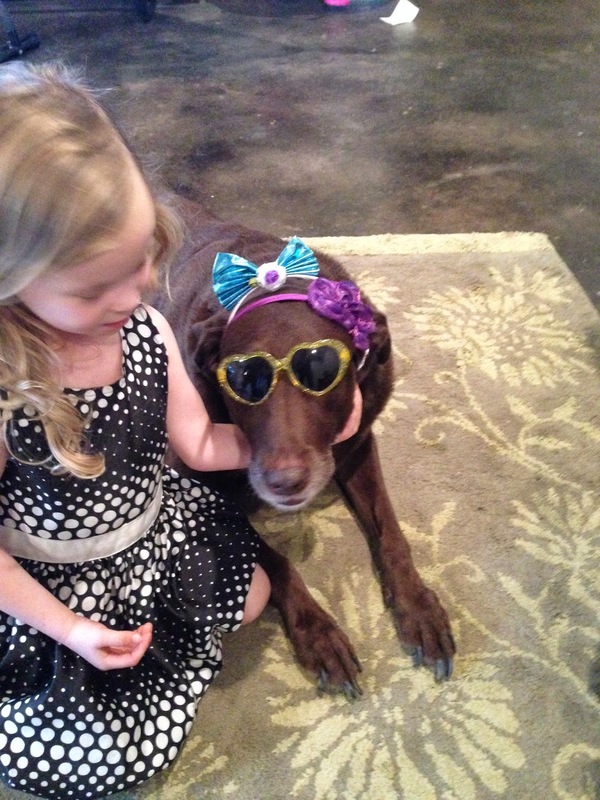 After all she LOVES our dog quite literally to pieces. A couple of days before the party little miss decided that she also wanted a princess party. It's a hard decision to make when your 4 guys! So although it was far too late to go another direction I decided I would add a little sparkle to the decorations and see if that would float her princess boat for this year. I did that by adding a sparkly gold polka dot fabric that I found for 50% off in the christmas isle. It was intended to be a fabric garland for the tree but it worked just as well as a table runner. The puppy face balloons were something I came across on pinterest but unfortunately there is no link to go along with the picture I found. Since her party falls in december she has lots of extra decorations along side her puppy stuff. I could not for the life of me get these puppies to turn my way for their photo shoot! 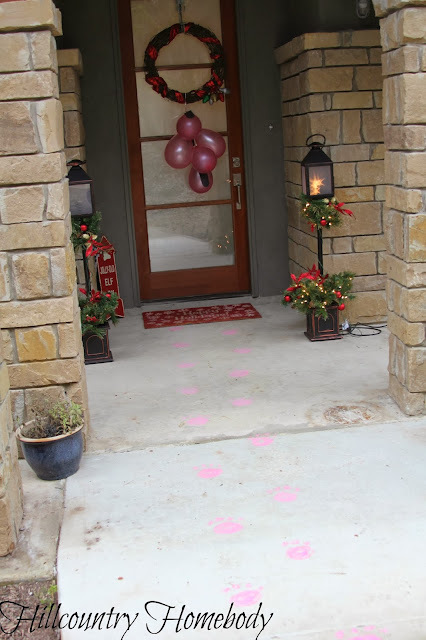 We quickly added some pink puppy paws on the sidewalk before the party guests arrived. This cupcake cake was also found on pinterest and unfortunately there is no link associated with it either:( I thought it was a great and easy way to make a puppy. Mine turned out a little crooked but hey everyone could tell what it was so that was a bonus! 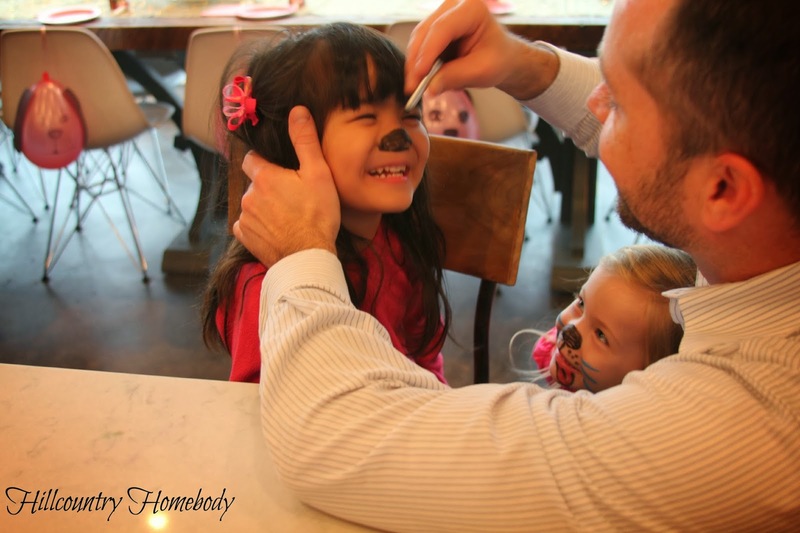 The hubs even offered up his face painting skills to turn all the precious little girls from school into pups. When the girls arrived they each got a set of felt ears that they could draw polka dots on or whatever their little hearts desired actually. The felt ears were glued onto cheapy little headbands except for the party girl who had spotted this fancy party hat that we modified into a fancy puppy party hat. After drawing ears, painting faces, eating cake, opening presents, and playing a very quick and unorganized game of pass the paw(like hot potato but with a dog paw and doggy tunes), the party was a success. I think she had a ball!